Many communities live in mountainous or glaciated terrain, with a constant threat of landslides and avalanches. Remote sensing methods, including construction of digital elevation models (DEMs), have the potential to detect deformation of the Earth’s surface—not only horizontally, but also vertically. While active sensors like radar are excellent for detecting this 3D change, passive optical data can also be used: when several images overlap, but are captured from different camera positions, remote sensing scientists can use the parallax of the various images to reconstruct the 3D picture of a target. Professor Sajid Ghuffar, in the Department of Space Science at the institute of Space Technology in Pakistan, used Planet’s Dove images to build 3D models in the Canary Islands and the Nanga Parbat massif in the western Himalaya. Most strikingly, he was able to detect vertical changes of ~80m on the Khurdopin glacier in Pakistan, which has been surging recently. To learn more about the methods behind this novel analysis, read the full paper, published with open access in the journal Remote Sensing. 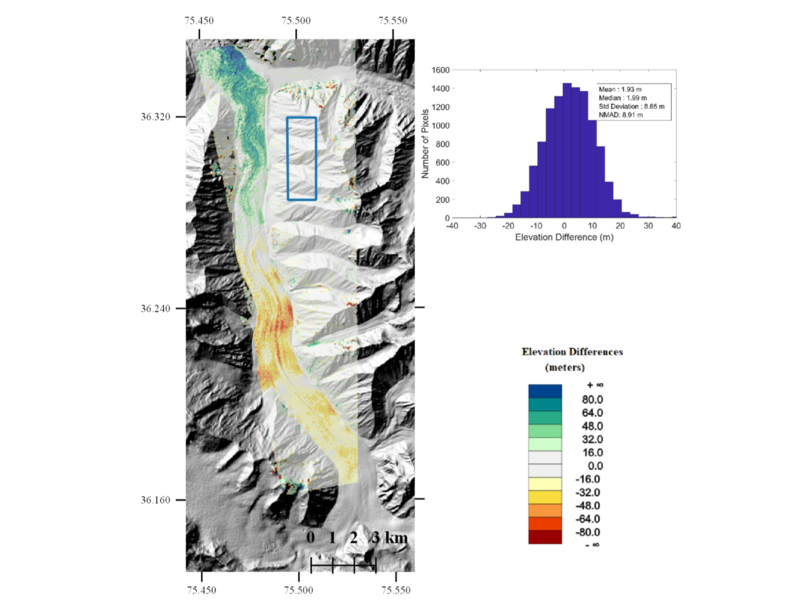 Professor Sajid Ghuffar used multiple Dove images to build 3D models of the land surface (DEMs), in this case allowing 3D change detection over the Khurdopin glacier in Pakistan.